Email not displaying properly? Follow this link. 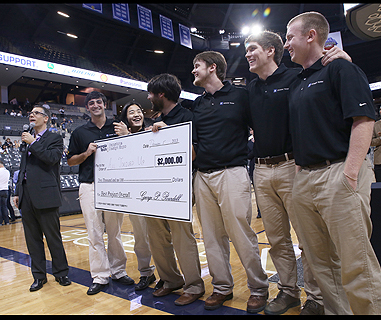 A lug nut starter that can save time on assembly lines took home the grand prize at the Fall 2013 Capstone Design Expo, the biannual smorgasbord of engineering and design projects. Created by six ME majors collectively known as All Torqued Up and supported by General Motors, the device can quickly place a lug nut on a tire so that workers can use a more powerful torque gun to tighten it. This video, featuring Dr. Bill Wepfer, Chair of the George W. Woodruff School of Mechanical Engineering at Georgia Tech, provides an explanation of the new undergraduate curriculum. This video, featuring Dr. David Laband, Chair of the School of Economics at Georgia Tech, provides an explanation of an ECON minor for ME majors under the new ME undergraduate curriculum. A piece of her article on FierceBiotech speaks specifically to her time at Georgia Tech and how she now gives back. The Story of ME is a series of videos that showcase the lives of students, alumni, and faculty who were impacted by their time spent at the George W. Woodruff School of Mechanical Engineering at the Georgia Institute of Technology. Each is a story of a helluva mechanical engineer! 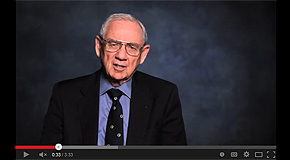 Ward Winer, Former Chair and Regents' Professor Emeritus, began at Tech in the Summer of 1969. He became the 7th Chair of the Woodruff School and held this position from 1988 to 2007. 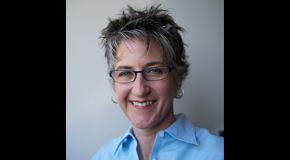 Dr. Winer has more than 200 publications and is a Fellow of ASME, STLE, AAAS, and ASEE. Enjoy his ME story. We're closing out another successful Fall term at the George W. Woodruff School of Mechanical Engineering - our 125th to be exact! 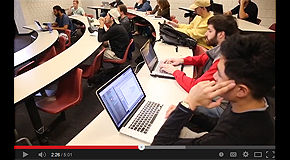 Copyright 2013 by the George W. Woodruff School of Mechanical Engineering. If you’d like to stop receiving this newsletter, unsubscribe.